What does an environmental analysis look like? What is its purpose? What should I research? Where do I find information about an organisation’s external environment? What is the structure for the assignment? The Common Wealth Bank is an Australian multinational bank. It provides its customers with retail and commercial banking and also with investment services and insurance. This also includes credit cards, deposit accounts, mutual funds and home loans. Its brands include Bankwest, Firstchoice, CommSec and ASB bank. It has more than 1000 branch offices in Australia and also has branches in Asia, Europe and USA. Its major competitors are National Australia Bank Limited, the Westpac Banking Corporation and the Australia and New Zealand Banking Group Limited. This analysis would be giving a brief on the impact the environmental changes would have on the functioning and growth of the Common Wealth Bank. The Business Council of Australia indicated in its 2015-16 Budget submission that sweeping cuts must be implemented to ensure the maintenance of Australia’s triple AAA credit rating, sustain its corporate and also financial viability and meet problems in any future global financial crisis, which means that it will provide funds to bolster finance houses and banks(Beams, 2015). This would help Common Wealth Bank in increasing its funding required and for the overall development of the organization. This also shows the dominance Common Wealth Bank can maintain in the market due to the support of the Business Council. The banking system in Australia has remained stable and all the banks are privately owned. The four major banks account for 87% of all household loans while other domestic banks provide just 7.6%. 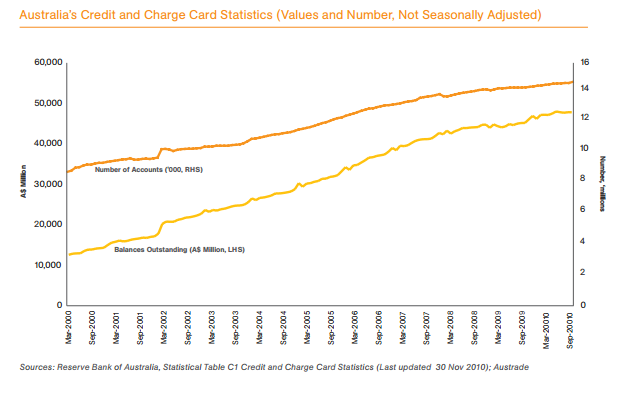 In the credit card market, as of October 2010, there 14.7 million accounts with the four major banks having 83.6% of the total bank credit card loan accounts (Government, 2011). This shows that the Australian market has been growing steadily and growth rate of Common Wealth also has been impressive. There has been an upward projection into the long term future of the business conditions, although the short term outlook remains negative. Apart from this, a strong economic growth helps the banks as it improves the standard of living of the citizens, increases the overall economy, increase the capital investment and has a positive effect on the business profits. Thus, Common Wealth Bank has a strong linkage with the economy of Australia………………………………. This entry was posted in Marketing and tagged Management Theory and Practice, marketing Assignment Sample. Bookmark the permalink.